DUCK LAKE CONDO - Moonshadow Resort was given its name many years ago because of the spectacular moonrises seen from the property. This insanely charming 3BR condo/cabin has so many wonderful features & nuances. To name a few: handmade Amish cherry countertops, hickory & 100 yr old re-milled naily heart pine flooring, in-floor heat in bath, abundant natural light, covered porch, red metal roof, and a spacious bathroom with stack laundry pair. There is a level sandy beach for swimming and the property is within paddling distance to some phenomenal local eateries. Everyone seems to be looking for a cabin exactly like this one, so only the quickest on the draw will be lucky enough to be sipping a cold Spotted Cow on the porch in the summer of 2019. To make things even easier for you, many furnishings are included. And no, the price is not a typo. You're welcome. I serve all of Oneida and Vilas Counties, including Rhinelander, Sugar Camp, Eagle River, Three Lakes, St. Germain, Lake Tomahawk, Minocqua, and many other wonderful Northwoods communities. I also service parts of Lincoln, Langlade, and Forest Counties. I specialize in Waterfront Properties, including properties on some of our famous Northwoods lake chains, such as the Eagle River/Three Lakes Chain, the Rhinelander Chain, the Sugar Camp Chain, and the Minocqua Chain. I also specialize in off-water residential properties and condominiums. I am fortunate enough to live and work in a place that some only get to visit once a year on vacation. This is why as a selling agent, assisting buyers in the purchase of a lake home means so much to me. It is tremendously satisfying when I am able to help a family acquire a Northwoods retreat, where treasured memories are soon to be born! I offer Buyer Representation, if you are interested in having an agent work on your behalf, to negotiate the best possible price and terms on a property. I am also very happy to help newcomers acclimate to the Northwoods with references, community information, and anything else that helps to ensure a smooth transition. As a listing agent, I dedicate myself to “Professionalism Unsurpassed” in the representation and marketing of your property. In partnership with you, my client, I develop a custom marketing plan based on your specific property, and its nuances. One size fits all marketing is not what I do. I look at each new listing as a project, with a unique set of amenities, intricacies, and challenges, and develop a marketing plan that ensures a successful sale, at the best possible price, in the least amount of time, with the least amount of stress or inconvenience to you, the seller. If you are considering listing your property and would like a free no-obligation market analysis, please call, email, or text me today! If you are an agent outside the area looking for dedicated, professional, full time Realtor to assist a buyer or seller that you know here in my area, please know that I treat all referred clients and customers with special care. I greatly appreciate referrals. 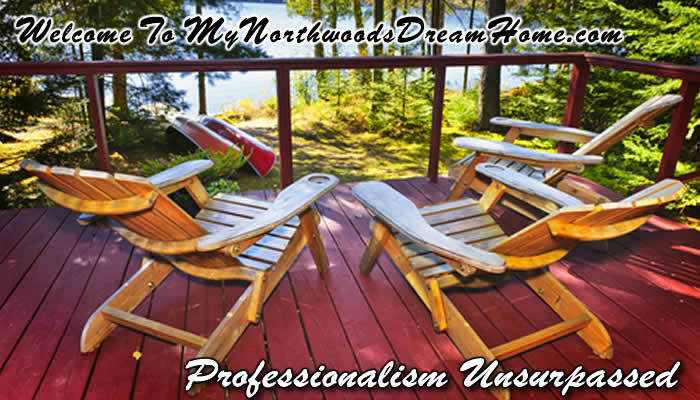 Thank you again for visiting MyNorthwoodsDreamHome.com!